This chapter provides a simple example of importing data set to perClass, training a classifier and executing it on new data outside of Matlab. Installing perClass is very simple. Add perclass and data sub-directories from perClass distribution to your Matlab path. This can be done either via File/Set Path menu or with addpath command. Toolbox with DB,imaging: The license expires on 1-jul-2014. For details on perClass installation process see Chapter: Installation. In this example, we will use "Fruit" data set. It is stored in the text file fruit.txt in the data sub-directory of perClass distribution. To create a perClass data set, we will first need to import it into Matlab. fruit.txt is a comma-separated text file with each row representing one data sample. The first two columns correspond to two features, the third column contains string class label. We obtain variable a which is an sddata object. The data set a contains measurements on 260 objects, each represented by two features. Each object also has a class label which corresponds to one of the three classes. The 'apple' and 'banana' classes represent genuine fruit to be processed on the extracted from the conveyor belt. The samples labeled as 'stone' are the outliers that should be rejected. The data set object is a data matrix augmented with meta-data information such as sample labels or feature names. The samples are stored as data rows and features as columns. Here, data is a numerical matrix with samples as rows and features as columns and lab are sample labels in a character array or cell array. Each marker represents one data sample, marker color and shape encode the class. Our goal is to build a classifier distinguishing between apples and bananas and discarding any other observation including known stones. 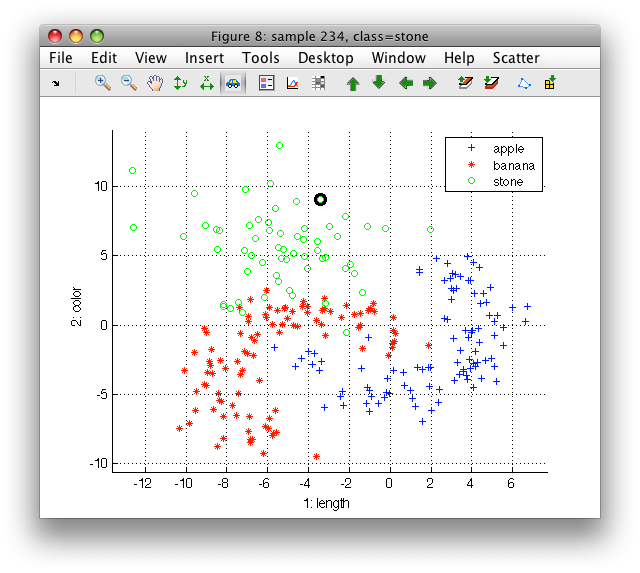 Such statistical classifier is build by training it on a set of labeled observations. In order to also test its perfomance, we need to use data unseen in training. Only then is our performance estimate realistic. 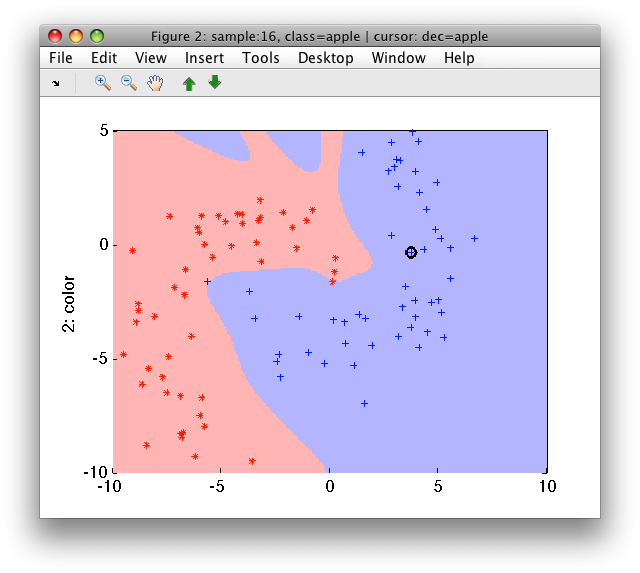 The output of sdneural command is a trained classifier, in perClass represented by a "pipeline". Pipeline is a sequence of operations that may be applied to new data. In the example above, the pipeline p gets trained on data set tr. Note that starting with perClass 4, every classifier returns decisions by default. The backdrop color indicates classifier decisions in each position of the feature space. Often, we need to know not only the eventual decision of a classifier, but the level of confidence. How to inspect "soft" classifier output? We can see, that our pipeline is a sequence of two steps, namely the neural network model and the decision. The first step returns confidences. Multiplying the data matrix with entire pipeline gives us decisions. Because we now provide a data matrix as the input, we receive the numerical vector with integer decisions (and not sdlab object as we did earlier). Use arrows on the toolbar or cursor keys to move between the two per-class confidence outputs. 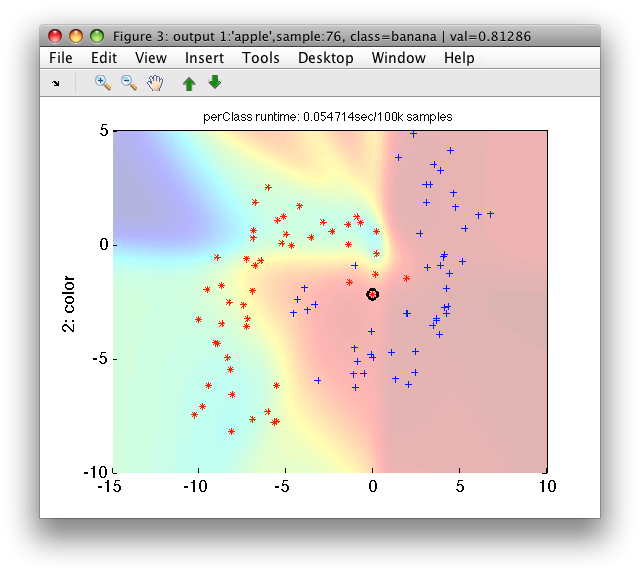 Eventually, we want to run our classifier outside of Matlab in a machine or a custom application. perClass provides a simple mechanism to export classifiers for execution using perClass Runtime library. This functionality is available in the Pro or Enterprise versions. This pipeline requires perClass runtime version 4.0 (29-mar-2013) or higher. Apart from standard C/C++ API, perClass distribution comes with sdrun command-line tool which can execute any exported classifier from command line without additional programing. where PATH_TO_EXPORTED_CLASSIFIER is the current directory in your Matlab session (use pwd command to display current directory). > ./sdrun.exe classifier1.ppl -d "6.0009 1.2879; -5.5805 -7.7396; 0.1531 0.5740"
> ./sdrun.exe classifier2.ppl -d "6.0009 1.2879; -5.5805 -7.7396; 0.1531 0.5740"
perClass Runtime may be embedded into custom applications using standard C/C++ interface or a separate .Net interface.